“Borrowing a book will as simple as getting a take-out”. This is not a slogan, but a new service taken by Jinan library to benefit the people. In order to further promote the construction of scholarly society, to facilitate the public to read, to promote urban civilization and to welcome the 19th National People's Congress with a good cultural atmosphere, on October 12th, “Enjoy Reading at Home in the Literary Spring City” service hosted by Municipal Bureau of Culture Press Publication and taken by Jinan library has implemented in a test run. In the future, it is not necessary to go to the library for the people who hold the borrowing card and want to borrow books. You just need to take out your mobile phone, pay attention to “Jinan Library Micro Service” (WeChat service number), bind your borrowing card with the “Online Borrowing” service, choose your wanted book and place an order. Then the staff will put the book into the beautiful bookcase and give it to the postman. You will receive the package in 3 days. Return the book can also use the "Online Borrowing" service. Postman will come to take the book and bookcase, and return book to the library. Of course, you can also go to the library to return the book. Before the end of November 30th during the test run, the cost of each logistics is only 2 RMB. At the same time, the disabled readers can borrow the book with free logistics as long as uploading the proof of physical disability 3 level and above. If you do not have the library borrowing card, it does not matter. In “Jinan Library Micro Service” (WeChat service number), filling in the relevant information through the “Online Borrowing” platform and pay 50 RMB deposit (including bookcase deposit) by WeChat, you can have an exclusive electronic library card with the same authority of the normal card. Each card can borrow 3 books in 60 days. Overdue fee is 0.05 RMB per book. Each book can be renewed only once (30 days) through the "Jinan Library Micro Service" (WeChat service number) or call the telephone number 83181512 (9: 00-17: 00). Each card is allowed to use 3 bookcases only at the same time. Jinan library is the first library to launch the “Internet +” service in ShanDong province. 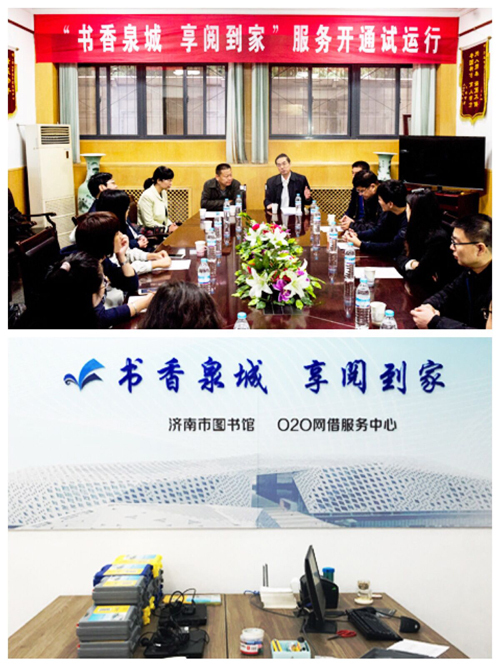 Jinan library has led the emerging model O2O into the field of public cultural services with advanced "Internet +" concept and networking technology to integrate and use the mature courier service. It makes the “Enjoy Reading at Home” service to upgrade again and promote the level of the public cultural service of the whole city.